What is Canadian Permanent Residence Status? Permanent residents (PRs) of Canada have been granted permanent residence status through the process of immigrating to Canada, however, they are not citizens of Canada. While they are citizens of other countries, they are still entitled to many of the same benefits as Canadian citizens, including, for example, the ability to work in Canada and health care coverage. People who travel to Canada temporarily, like students and foreign workers, are not permanent residents. As such, they aren’t entitled to the same benefits. Canadian Permanent Residence Status offers many benefits. First, it gives you the right to live, work or study anywhere in Canada. As mentioned above, it also grants you access to the same social benefits as Canadian citizens, including health care coverage. It also means that you are protected under Canadian law. You can also apply for Canadian citizenship. Along with all of these benefits, you must pay taxes and follow Canadian laws at all levels. Am I Eligible to Apply for Canadian Permanent Residence Status? There are many different circumstances under which people may be eligible to apply for Canadian Permanent Residence Status. According to the Canadian government, these are broadly categorized under Economic classes and Non-Economic classes. For those in the economic classes, applications are processed on the grounds of the applicant’s ability to become economically established in the country. In contrast, people may also apply under the non-economic classes. In this case, applications are processed based on family reunification, social and humanitarian reasons. Economic classes include (but are not limited to) federal skilled workers, entrepreneurs, investors, start-up business class, caring for children or those with high medical needs, live-in caregivers, and Atlantic Immigration Pilot programs. You can find the application form for economic classes here. A successful refugee claim does not automatically confirm permanent residence status, the applicant is still subject to security and police clearance. In order to become a permanent resident, your claim has to be approved by the Immigration and Refugee Board. In these cases, a Toronto refugee lawyer (or a lawyer in the city where you are located) is often a great resource for understanding your personal case, especially if your application is rejected. Non-economic classes include adoptions, spouse/common-law partner class, humanitarian/compassionate consideration, protected persons or temporary resident permit holders. You can find the application for non-economic classes here. 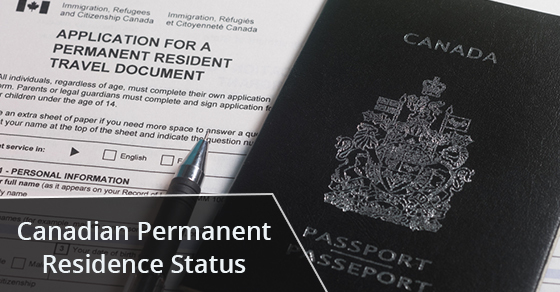 You can read more about the different types of Canadian Permanent Residence Status on our website. Max Berger is a leading Toronto immigration lawyer. Max Berger Professional Law Corporation is a premier Canadian full-service immigration law firm, and has been since 1987. Contact us for more information.